Here are all of the project Pan items. First Aide Beauty Skin Rescue Deep Cleanser with Red Clay: Started with 95% and have about 5-10% left. This is going to be a full size purchase once I finish this and finish my CeraVe Creamy Face Wash (it is a full size in the shower), which I hate so I am hoping to wrap it up quickly. Josie Maran Argan Oil: Started at about 80% full and there is about 10% left. This came from a Sephora point redemption I believe. I personally do not find it to be anything special and I still have a Tarte Marajuca Oil to finish. Epice Purifying Exfoliant: Done. I started with being almost full. This product came in a ipsy bag, I really like the smell but it does not seems to be something that I can readily purchase in a store, so won’t be getting it again. NYX Radiant Finishing Powder: I keep using it almost daily and there is dip but who knows how long this will take me to use. Etude House PoreForever: Let me tell you this and almost every other product I will talk about will have a similar theme: NEVER ENDING! I had about 80% of this when I started and I am sure there is still 70% left. I have been wearing a full face daily to try and get through this so I can start on ,what is probably one of the last few animal tested products in my collection, Maybelline Baby Skin pore filler. Oh and I would repurchase this. NYX HD Concealer: This one is tricky, I would say I had about 50% left and I can is gaps in the product on the side but it is hard to tell really how much is left. I am continuing on trucking through this, since I am not a huge concealer wearer I am not sure on the repurchase and I am really interested in trying the Rouge Bunny Rouge highlighter that is supposedly a good dupe for the Maybelline Instant Age Rewind Eraser. NARS Oil-Free Primer: I am about 50% through this. It lingers around because it only plays nice under my NARS foundation which until recently was not looking good on my skin tone. I am not repurchasing this once it is done and I am pretty sure I will not be repurchasing the foundation either, but not positive on that yet. Pixi Flawless Beauty Primer: This was about 50% full and I think I have maybe three uses left. This also came an ipsy bag, I believe my first one actually. Here is my issue to me for a “drug store” brand Pixi is pretty pricey. It does have a nice texture and for the winter it seems to be working out well. But it is not something I am likely to repurchase and I am still looking for a HG primer. UD b6 Vitamin-Infused Complexion Prep Spray: So I have one that I received this spring in a Reddit exchange and another this fall when I repurchased the Naked foundation kit. I have about 10% left of the first one and 100% on the second one. I am really not sure the purpose of this product. I do not see my makeup wear any differently when I use it versus when I do not. Not going to be a future purchase for sure. UD All Nighter Setting Spray: This also is close to being wrapped up! It came with the prep spray in my spring exchange. I believe that I like the oil slick setting spray better but this one does its job. I am thinking of trying out the Kat Von D setting spray next but I may just stick with a single brand, still thinking on it. Skin Food Peach Sake Finishing Powder: I really need to pull the plastic sifter out to see how much is left but seriously this is one of those never ending items. I love the way it smells and it does feel lovely on the skin but I won’t be repurchasing it. I have serious new love for Fyrinnae’s finishing powder in Fluff and Hollywood Sorcery. Shiseido Urban Environment Oil-Free UV Protector: One is almost gone and the other is a back up, I figure about 20% left. This was my HG sunscreen until I discovered that they test on animals. I feel seriously led astray, I was told by a girl at Nordstrom that Shiseido did not test on animals. Once I found out they did I resolved to do much better research when purchasing items. I am going to finish it up because this stuff isn’t inexpensive by any means. I am still in the search fora cruelty free sunscreen that I can use on my face that will not freak my skin out. UD Perversion: THIS IS GOING IN THE TRASH /end rant. I hate this formula more than I hate bananas and if you know me you know what I am about to type I do not type lightly, I would rather eat a banana than ever wear this mascara again. It doesn’t ever fully set on me and I am not sure if it because it is a deluxe size but so much comes out on the brush that when you go to put it back in mascara oozes out the top. I just could not keep using it and I launched it with glee in the trash last night. UD Supercurl: On the other hand I love this one but I should let it go it is over a year old. I really can not understand how any one can use a mascara up within the appropriate amount of time. This isn’t even a full size one! I am debating about purging this one also just due to age. Buxom Lash Mascara: I loooove the brush on this and the formula! I actually purchased a water proof full size during the Sephora VIB sale, which is part of my reason I want to get through all these deluxe ones. This one is about 6 months old but i am going to keep using it. Make Up For Ever: This was in my Sephora birthday gift. I like the formula, the brush is a bit bonkers and sadly they test on animals. I believe it was 2012 they decided to sell in China and they were taken off the cruelty-free list. I have been battling with myself with this and with a few lingering items, if I should just toss them since I strive to be an good advocate for animals. I am thinking it may just be that I do throw them away. It hurts my heart so much to read about what these animals go through and even though this was an item in a gift set or the items I purchased it before I went cruelty-free is it really right for me to use them. Thoughts? Fresh Sugar Shine Lip Treatment: So along the lines of the previous product, I purchased this before I went cruelty free. I have been using it nightly of course with guilt as I put it on and look at my cats and wonder how animal testing is still allowed with all of the advances in science. I won’t continue to wax on about this, but I will be making a decision this weekend on what to do with the four products in question. Notoriously Morbid Coffin Kisser in Terrified Mint Tango: This was completely unused at the start of December and I believe that I am about one quarter to almost halfway done. I can’t tell because it will not twist down any more, it will only twist up. If you follow my blog you know that I love Notoriously Morbid and I really love the formula of their coffin kissers. I have quite a few to get through so I am on a no buy for lip balm. Alright so that is it! I have my 2015 Project Pan/ Pan That Palette challenge kicking off and what I did not finish here will be for my mini January Project Pan that I participate in over on /r/makeuprehab. 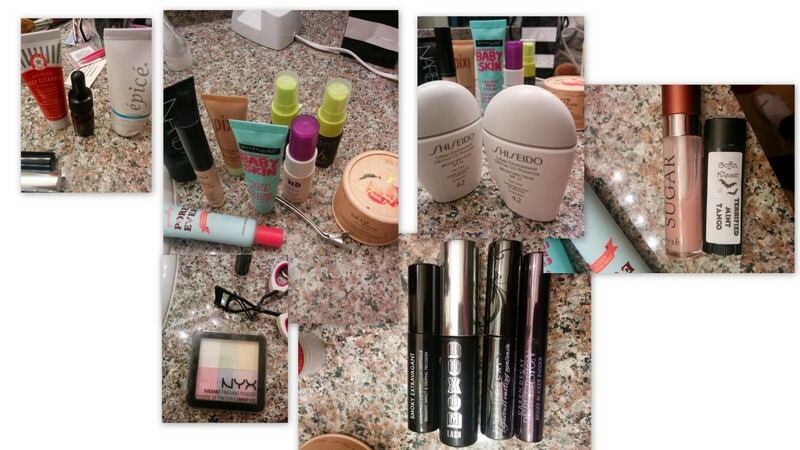 This entry was posted in Makeup, Review and tagged beauty blogging, cruelty free, projectpan. Bookmark the permalink.